The new Sony A5000 is a rather modest refresh of last year's NEX-3N cameras, ditching the NEX branding, upgrading the image sensor and processor, and adding wi-fi and NFC connectivity, a better handgrip and the more intuitive Alpha menu system. Despite a slight price increase, the A5000 remains an excellent first "serious" camera for smartphone/compact camera upgraders. 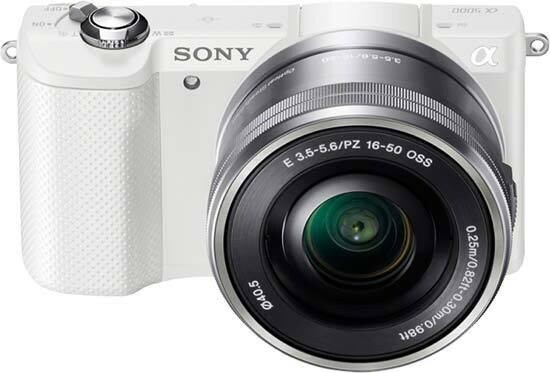 Looking and feeling very much like a compact camera, thanks to the combination of the finger-tip zoom lever and the 16-50mm power-zoom kit lens, the small and lightweight Sony A5000 is a great introduction to interchangeable lens cameras. Despite its diminutive size, the new A5000 still manages to retain its predecessor's built-in flash and 180-degree tilting LCD screen, although we're disappointed that the spec of the LCD hasn't been improved from 460K-dots. The new handgrip is a little easy to hold than on the NEX-3N, but not so much that you'd really notice. The built-in wi-fi and NFC connectivity, borrowed from the more expensive NEX-5T camera, make it straight-forward to share your photos and remotely control the A5000 itself, although there still aren't too many NFC-enabled devices around at the moment. Image quality is excellent, with results from the 20 megapixel APS-C sensor proving the equal of last year's 16-megapixel imager. Noise doesn't really rear its ugly head until ISO 3200 for JPEGs, although the A5000 does apply pretty aggressive noise reduction to keep the files clean, resulting in some loss of finer detail. The myriad of creative effect on offer such as HDR, Dynamic Range Optimisation, creative styles, the innovative sweep panorama mode and the range of in-camera Picture Effects help to get the most out of the A5000, especially if you like to experiment away from a computer. With an official price-tag of £420 / $500 with the 16-50mm kit lens, the Sony A5000 is a little more expensive than the previous NEX-3N model, but it still significantly undercuts the company's own high-end compact, the RX100 MK II, and is more than competitive with rival models. Highly Recommended!